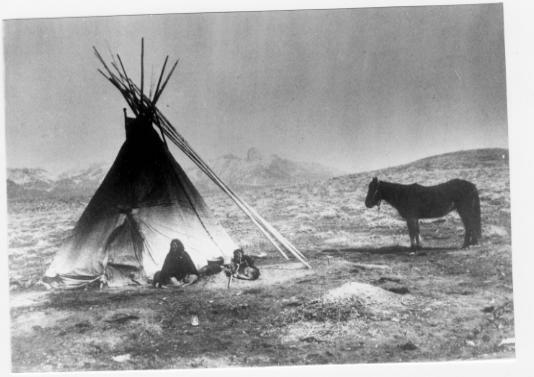 A group of Utes were camping on the shores of Grand Lake when they were suddenly attacked by an enemy tribe of the Arapaho (and in some versions the Cheyenne as well). As the brave Ute warriors began fighting, the women and children were hurried onto a large raft for safety and pushed to the middle of the lake. As the battle continued, a treacherous wind overturned the raft and all the women and children were drowned. 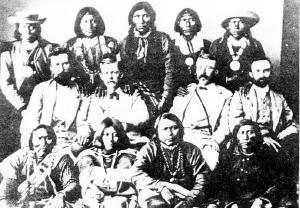 Many Ute warriors were also killed during the fighting. The legend holds that you can still see ghostly forms in the morning mist rising from the lake and hear the wailing of the lost women and children beneath the winter ice. The Utes avoided the lake for many years because of these tragic events and evil spirits. 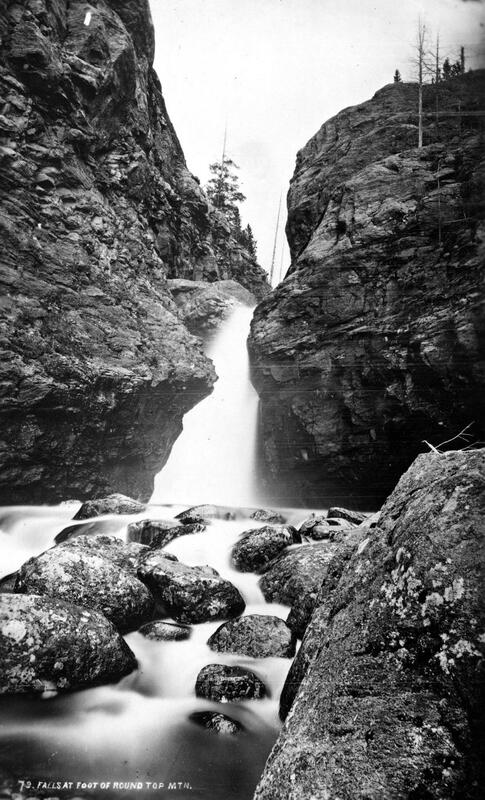 Major John Wesley Powell was in the first party to make a recorded climb of Pikes Peak in 1868. Later, he would lead the first expedition of the Green and Colorado (Grand) Rivers. 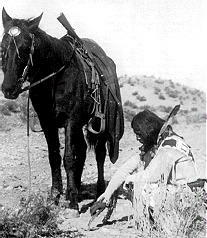 He was very interested in the Indian tribes that he encountered and later became head of the new U.S. Bureau of Ethnology. He recorded this legend as told by the Utes on his first visit to the Colorado mountains, during his Pikes Peak climb. A chief of the Utes mourned the death of his beloved wife, and his grief was so deep, that no one could console him. Then the Great Spirit, Ta-Vwoats, appeared to him and promised to take him southwest to where he could see where his wife had gone, if he would promise to grieve no more. Ta-Vwoats rolled a magical ball before him and it crushed mountains, earth and rocks, making a trail to the land of the afterlife. Following the ball was a rolling globe of fire which the Great Spirit and the chief followed. At last they were in the happy land where all was blessed with plenty and joy. This was where the chief's wife had gone and he was glad to see it. When they returned, Ta-Vwoats told the chief that he must never travel that trail again during life and warned all the people against it. Knowing that those who had lost their loved ones would be tempted to make the journey, Ta-Vwoats rolled a river into the canyons so that no one could enter. The idea of diverting water from the Colorado River on the Western Slope of the Continental Divide to the productive farmlands of the eastern plains had been a dream of planners as early as 1929. Subsequently, a long period of drought and the sagging economy of the “Great Depression” whetted demands for what became the largest trans-mountain diversion project ever built. The Colorado-Big Thompson Project takes water from Grand Lake on the western side of the Continental Divide to the Big Thompson River on the east. The water flows through a 13 mile tunnel beneath Rocky Mountain National Park. In order to supply the residential and farming needs of Northeastern Colorado, the project was begun in 1938 and continued through the years of World War II. The first water flowed though the tunnel, named for Senator Alva B. Adams, on June 23, 1947. In order to assure an adequate supply from Grand Lake, a dam was built creating Shadow Mountain Reservoir. 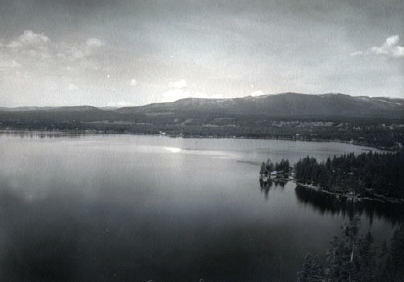 A larger lake, Granby Reservoir was then built below, with a unique pumping plant that forces water into Shadow Mountain. The Farr Pumping Plant cost over $9 million and provides an additional 700,000 of irrigated land to northeastern Colorado. Further reservoirs were added, both to supplement the diversion and to compensate the water needs of Western Colorado. These include Willow Creek and Windy Gap Reservoirs in Grand County. Claims on the water of the Colorado River range from the fruit and wine regions of the Grand Valley in Colorado all the way to Los Angeles and Mexico. It can be said that every snowflake which falls in Western Colorado had already been over-appropriated, especially during drought periods in the arid West. The span crossing the Colorado River on State Highway 9 southeast of Kremmling is known as the Kimball Bridge. It honors the memory of William H. Kimball who carried the mail over Berthoud Pass from Empire to Hot Sulphur Springs by foot, winter and summer. Kimball was born in Maine and accepted the Middle Park mail contract in 1875. Although reportedly nearly blind, Kimball traveled on snowshoes all winter carrying a backpack of mail weighing 70-105 pounds, day and night, at least once a week. 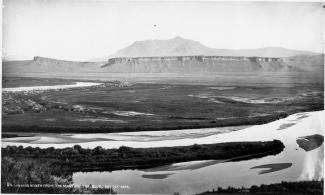 In 1884, Kimball established a flat bottom ferry over the Colorado River near the spot where the bridge now stands. Before that time, no wagons could cross at that area. With the addition of the ferry, load of game meat and fish could be taken up the Blue River to be traded for much needed staples. Kimball never married and lived at a nearby ranch until his death in 1909. Forrest Wheatley was born in Chicago in 1875 and his brother George R. was born 6 years later. Their parents were English immigrants, William and Mary. 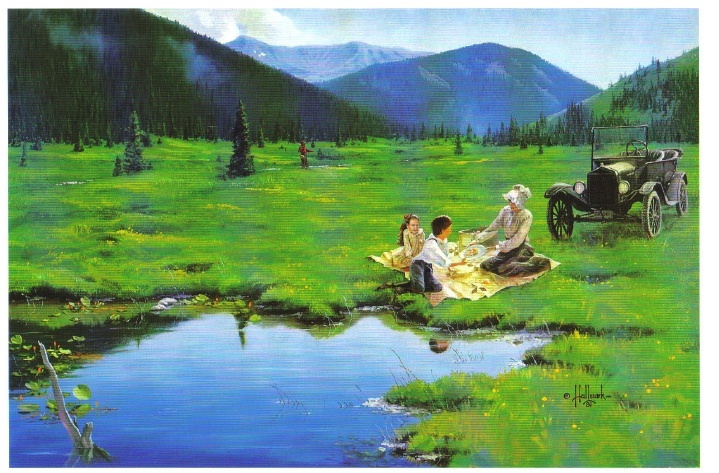 The family moved to Denver in 1887 where William pursued his trade of upholstering carriages. After Forrest returned from service in the Spanish American War in 1900, he and George decided to establish homesteads of 160 acres each on the East Fork of Troublesome Creek. When the expansion of the National Forest land limited the growth of their holdings, they moved to Muddy Creek to the west and ran their operation there until 1929. They continued to purchase additional homesteads on the Troublesome. The brothers had a disagreement so Forrest and his wife Ida remained on the Muddy while George moved back to the Troublesome. He sold the original claims high on the East Fork. Later he married his neighbor, Bessie Sampson, and they moved back to the Muddy Creek basin and had five children; George, Douglass, Kenneth, Maidie and Gene. Gene drowned in an irrigation ditch while still a young child. Through purchases and marriages, the Wheatley descendents eventually owned property throughout western Grand County and as far north as the Yampa River Valley. In 1938, Grand County decided to establish a library to act as a central reservoir of knowledge for its citizens. The community realized that few people can purchase all of the books and other materials which they may need, and so they agreed to pool their money in the library to build its central collection. At the same time they wanted to be sure that their interests would always be represented in the operations of the library, and so they formed a board of trustees from among themselves. At about the same time, the federated women's clubs in Granby and Grand Lake, for the same reasons, set up lending libraries in those two communities. Run by the clubs for many years, both were eventually incorporated into the County Library. In 1994, the Committee to Protect the Library was established to petition the Board of Commissioners to increase funding for the library to set aside a completely separate library fund, which would be administered as a Library District. The voters approved the move on November 8, 1994, and Grand County Library District was formed on January 1, 1995. Today, the library still serves that same basic function for the community as well as new roles acquired in the intervening years. Kremmling started as a general mechandise store, owned by Rudolph (or Kare) Kremmling, on the ranch of Dr. Harris, located on the north bank of the Muddy River. 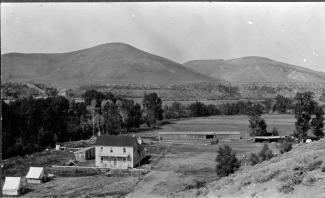 In 1888, John and Aaron Kinsey had part of their ranch platted, calling the site Kinsey City. 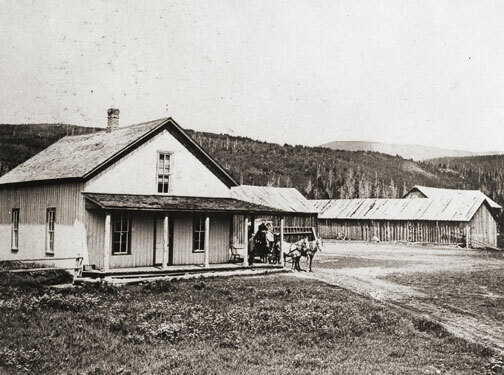 Kremmling moved his store across the river from the new site and the town that subsequently developed became known as Kremmling. 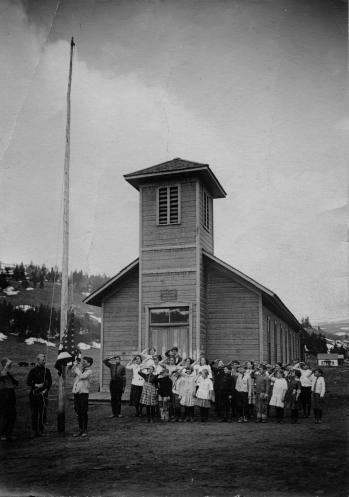 There was a post office established at Kremmling as early as 1885 and the town was incorporated in 1904. The Middle Park Fair was established here in 1912. Famous Western Novelist Zane Grey spent time in Kremmling and, as a result, wrote "Mysterious Rider" in which the area is shown as a classic Western setting. During World War II the town was the location of a prisoner of war camp where German prisoners cut ice that was shipped by rail to other locations. 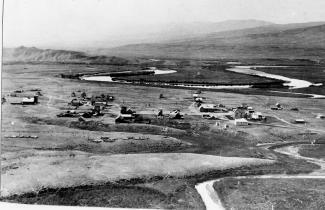 The local ranching industry, the presence of the railroad and its strategic location at the confluence of the Colorado River, the Blue River, and Muddy Creek made Kremmling a natural location for a town, which still retains the “Old West“ atmosphere. Middle Park is one of three big parks in the Colorado Rockies and covers a large portion of Grand County. Like North Park and South Park on either side, Middle Park is a large open area of meadows, river valleys, woodlands, surrounded by mountains. 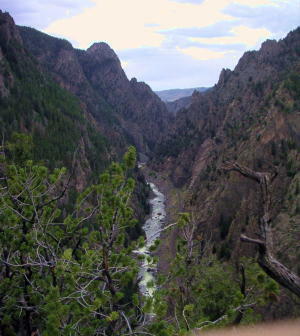 It is also the headwaters of the mighty Colorado River. The first printed account of Middle Park was written in 1839 describing abundant antelope, deer, big horn sheep, bears, buffalo and elk. The word “parc” is of French origin and so it is logical to assume that French trappers named this location. In 1819 the Adams-Onis Treaty partitioned Middle Park so that Fraser, Granby and Hot Sulphur Springs, had they existed, would become part of the United States; however, Kremmling would have belonged to Spain! Later, Kremmling would have been part of Texas. While political boundaries have changed, the beauty of the park remains the same. 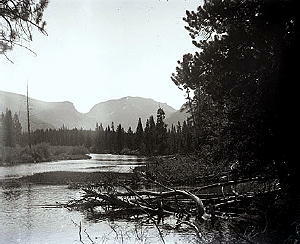 As Middle Park is entirely surrounded by mountains, Robert C. Black, who wrote the area’s definitive history, chose to call his book, Island in the Rockies. The Three Lakes area encompasses the north-east corner of Grand County and is so named because of the three connected lakes of Grand Lake, Shadow Mountain Reservoir and Granby Reservoir. The two reservoirs were formed as a part of the Colorado-Big Thompson Project, which takes water from Grand Lake on the western side of the Continental Divide to the Big Thompson River on the east. Shadow Mountain Reservoir and Granby Reservoir. connected by a unique pumping plant, assure that the Grand Lake water level remains consistent. Further reservoirs were added in the Three Lakes area, including the Willow Creek and Windy Gap Reservoirs.